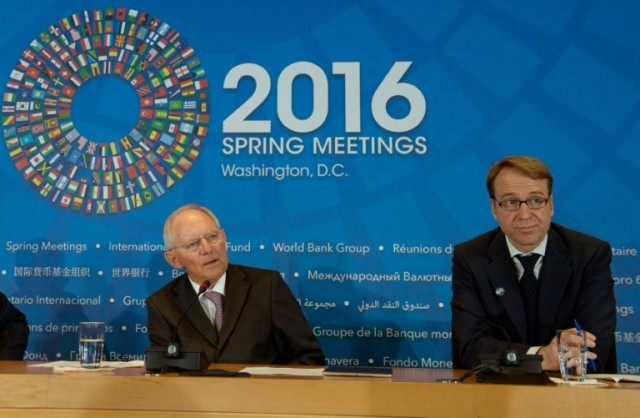 Washington (AFP) – World finance ministers pledged to boost growth on Saturday at IMF and World Bank Spring Meetings tainted by lingering worries about the dragging global economy and hints of discord. Pounding home the message that each country needs to take action to ramp up growth, and following another week of relative calm in financial markets, the IMF leadership said they were “positive” about the outlook, even as they warned of high risks. Yet with a rising number of developing countries approaching the two powerful institutions for support to deal with the plunge in commodity markets and tighter credit, there was no clear response to calls to organize an international backup plan if growth begins to stall again. “The IMF is alert but not alarmed,” said Agustin Carstens, chairman of the IMF’s steering committee, as the meetings wound up in Washington. Fund members had agreed on the need to quickly take “mutually reinforcing” actions to support global growth, he added. The IMF began the week announcing it had slashed its outlook for global growth this year to a low 3.2 percent. It warned that refugee flows, more volatility in financial markets, a surge in corporate defaults and “Brexit” — Britain’s threatened pullout from the European Union — were all serious threats to the precarious global economy. But after dozens of meetings with Fund members large and small, IMF Managing Director Christine Lagarde was more optimistic at the close. “You don’t make any progress unless you have a positive attitude,” she quipped. The commitments of each country to the lender’s “three-pronged approach” to firing up growth remained vague — another sign of concern for experts. The Fund has called for countries to act with monetary policy, fiscal spending and structural reform to boost economic activity. But with a number of top central banks having already taken their interest rates negative and others at ultra-low level, many fear the further impact of monetary policy is limited. And many countries lack the surplus financial resources to increase spending to spur growth. The United States, enjoying the strongest growth of any of the top developed countries, and pressured to spend more on things like infrastructure, said it was already doing its part. “The United States cannot and must not be the only engine of growth, nor the importer of first and last resort for the global economy,” said US Treasury Secretary Jacob Lew, his words hinting at looming discord should the rest not pull their weight. Germany, another of the countries pressed most to deploy its surpluses to spur growth, says the answer is for others to reform their economies. “Repeated downward revisions of global growth over the last years highlight that structural factors are at play,” said German Finance Minister Wolfgang Schaeuble in a policy statement to the IMF. That did not appear to assuage weaker countries. As Carstens pointed out, emerging economies are exposed to tightening financial conditions, pressure on their currencies and not a lot of fiscal or monetary room to move. The IMF has announced possible bailout programs for several countries in recent weeks — Angola, Tunisia, and Surinam the most recent — and more are expected to come. World Bank President Jim Yong Kim said that the Bank is fielding a surge of requests for help at levels only seen before during financial crises, underlining the fears of many. Calls by some for the World Bank and IMF to organize a contingency plan, including larger emergency financial resources in case the world moves into recession, were not answered. “We also need external support and we need a global financial safety net. We need to have access to resources that need to be available,” said Mauricio Cardenas, Colombia’s finance minister, speaking on behalf of the G24 group of emerging economies.